1220 Origin, a botanical inspired gin, is the first of the spirits to be released is available year round. This is a botanically driven gin made in the New Western style. Origin’s ingredients are unique. Starting with a neutral brandy from the vineyards of Napa Valley, Origin builds on its base with a highly select grade of juniper along with singular ingredients like Neroli and Bergamot (the Prince of Pears). At 85º, Origin can be enjoyed neat but is just as exceptional in cocktails. 1220 Encrypted Vodka is a remarkably smooth spirit. Made from Missouri corn that is 6x distilled, it is then combined with a small portion of California wine country’s finest grape neutral to round out the body and give this premium vodka an exceptional finish. 1220 Barrel Reserve Gin is a standout amongst spirits. A little-known category with big flavor, this gin is made with just 3 botanicals. The secret is in the barrels. Given to us from Big O Ginger Liqueur’s Reserve program, 1220Barrel Reserve Gin melds with the bite of fresh ginger and spices while resting for 3 months, producing a spirit that is woodsy, spicy, and warming. 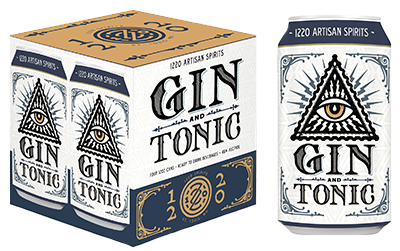 1220 Canned Gin & Tonic is a classic cocktail in a convenient package. Made from 1220 Spirits flagship Origin Gin and our house recipe tonic, this 12oz package packs a lot of flavor.